The king vulture is a large bird found in Central and South America. It is a member of the New World vulture family Cathartidae. This colorful vulture lives predominately in tropical lowland forests stretching from southern Mexico to northern Argentina. 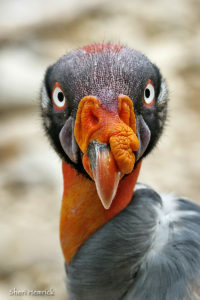 The king vulture is mostly white, with gray to black ruff, flight, and tail feathers. Its head and neck are bald, with the skin color varying, including yellow, orange, blue, purple, and red. The king vulture is a scavenger, and it often makes the initial cut into a fresh carcass. It also displaces smaller New World vulture species from a carcass. Conservation Status: King vultures were popular figures in the Mayan world, as well as in folklore and medicine. Though currently listed as Least Concern by the IUCN, they are decreasing in number due to habitat loss. King Vultures have been known to live for up to 30 years in captivity. However, Cameron Park Zoos’ female is over 50 years old. Cameron Park Zoo has one of the most successful king vulture breeding programs in the world.